This section contains description of solving the following simple task in C# and VB.NET. We shall use Visual Studio 2008 as programming environment, however the same results may be received in the Visual Studio 20102015 IDEs. In this and the following sections we shall use the "procedure" notion not only for VB.NET subroutines but also for C# functions with the void return type. The Begin3.cs file contains definition of the MyTask class; this class is a descendant of the PT class defined in the PT4 namespace. The MyTask class includes the Solve procedure as its method. The Solve procedure already contains the Task procedure call that initializes the Begin3 task. The Begin3.vb file contains definition of the Solve procedure; this procedure already contains the Task procedure call. The solution of the task should be entered in the Solve procedure (of course any other procedures and functions may be used). Note that the Task procedure (just as Get-functions and the Put procedure) is a class method of the PT class (all these methods are declared with the "static" attribute in C# and the "Shared" attribute in VB.NET). In C# all these methods are called in the Solve method of the MyTask class (that is a descendant of the PT class), therefore it is not necessary to qualify these methods with the PT prefix. In VB.NET the PT prefix is not necessary due to the "Imports PT4.PT" directive. Also note that definition of Main procedure is absent in the Begin3.cs and Begin3.vb files. The Main procedure is defined in the pt4main file that was created when the project was generated for this task (the pt4main file has .cs extension for C# and .vb extension for VB.NET). The pt4main file is not loaded into the editor of Visual Studio. But the project includes this file (see the Solution Explorer window located on the Visual Studio window). 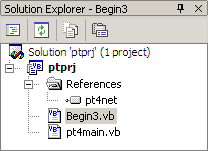 The project also includes the pt4net.dll library. This library contains classes used by Programming Taskbook, in particular the PT class. To run the program press [F5] key. When the program is launched you will see the Programming Task window with a task text and initial data. Here is the screenshot of the window for the C# language; the window for VB.NET has the "[Visual Basic.NET]" caption instead of "[C#]". This running is considered as acquaintance running because the program does not perform input-output operations. To close the Programming Taskbook window click the "Exit" button or press [Esc] or [F5] key. Begin3      S23/02 20:13 Acquaintance with the task. Begin3      S04/02 15:07 Invalid type is used for an input data item. Begin3      S04/02 15:09 Correct data input. Begin3      S04/02 15:12 Wrong solution. Begin3      S04/02 15:15 The task is solved! The letter "S" denotes the programming language being used (C Sharp).